The Red-cockaded Woodpecker (Picoides borealis) is a small to medium-sized bird between the Downy and the Hairy Woodpeckers. A non-migrating and territorial woodpecker, he takes his name from the ornamental red patch on his head which resembles the cockade, or decoration, such as a rosette or knot of ribbon found on hats. 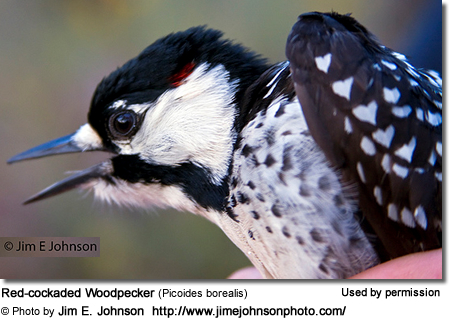 Red-cockaded Woodpeckers dwell in mature, open-pine forests in the southern United States. The Apalachicola National Forest in Florida’s panhandle is home to the state’s largest population. They are not easily seen, but can be observed in early morning and sunset as they are foraging. The best time to get a glimpse of them is during breeding season, between April and July. The Red-cockaded Woodpecker inhabits the southeastern United States. In the past, this bird could be found from Florida to New Jersey and Maryland, as far west as eastern Texas and Oklahoma, east to the Atlantic Ocean, and inland to Missouri, Kentucky, and Tennessee. But today, there exists only about one percent of the original population. Another estimate states that there are only about 5,000 groups, or 12,500 birds, from Florida to Virginia and west to southeast Oklahoma and eastern Texas. They have become locally extinct in New Jersey, Maryland, and Missouri. Its highest numbers dwell in Florida. The Red-cockaded Woodpecker is one of the few avian species to be endemic to the United States, and its presence in the southern, old-growth pine forests is essential to the well-being of the woodlands. After the Red-cockaded leaves its tree cavity, other birds and small animals move into it, benefiting from it indefinitely. Chickadees, bluebirds, titmice, and several other woodpecker species, including the Downy, Hairy, and Red-bellied Woodpeckers, will seek to occupy these tree holes. Even the larger woodpeckers, such as the Northern Flicker and Pileated Woodpecker, will arrive and expand the hole for their own use. At times, the holes become sufficiently augmented that even Eastern Screech Owls, Wood Ducks, and raccoons will occupy them after a time. Flying Squirrels, several species of reptiles and amphibians, and insects (primarily bees and wasps), will also make use of their tree cavities. The mature, Long-leaf pine is their tree of choice, but they will excavate their nest cavities in other pines as well; they prefer trees that are at least 70 year old. 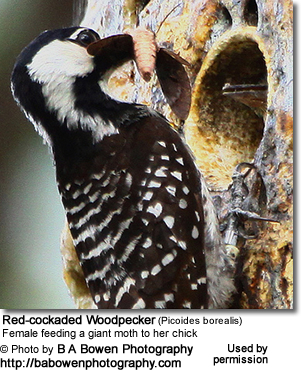 Unlike other woodpeckers, who would rather build their nests in dead trees with rotting, soft wood, the Red-cockaded Woodpecker makes its home exclusively in live pine trees and is the only woodpecker to do this. They will seek out older pines which have been subjected to summer fires or have been attacked by a fungus called “red heart rot.” This disease attacks the center of the trunk, causing the inner wood, the heartwood, to become soft. This species spends much more time than most in excavating their nest cavities—anywhere from 1 to 3 years. The aggregate, or grouping, of cavity trees is called a cluster. This cluster generally consists of 1 to 20 or more cavity trees on 3 to 60 acres (12,000 to 240,000 m²). The average cluster covers an area of about 10 acres (40,000 m²). When a cavity tree is actively used, it will contain many small wells which hold resin and exude sap. The birds work these resin wells to keep the sap flowing. Around the cavity entrance, this woodpecker drills many tiny holes, allowing the sticky sap to flow freely from the openings. The bird also strips away the bark surrounding the entrance. By doing this, the gooey resin and the smooth trunks create a defense against arboreal snakes, one of the birds' major predators. A reddish color around the resin wells and cavity entrance is a sign that the birds have recently been actively working on the cavity tree. 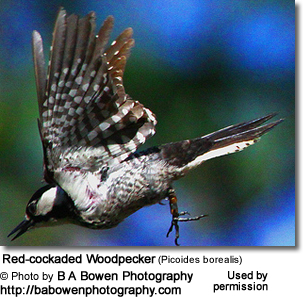 Another unusual behavior of the Red-cockaded is their use of other types of southern pines that most woodpeckers avoid: loblolly (trees which live in muddy areas), short-leaf pine (aka rosemary pine, yellow pine and old-field pine), and slash pine (a hard, yellow, fast-growing pine). Since each bird needs its own tree hole in which to roost at night, they will drill out cavities within a cluster of trees. Groups of Red-cockaded Woodpeckers require a land expanse of around 125 to 200 acres (500,000 to 800,000 m²), but some bird watchers claim that 60 acres is on the low end of the territory size. The birds may use as many as 600 acres (2.40 km²), depending on how suitable the habitat is and how many birds and other animals inhabit the area. All the birds in the colony forage at the same time, and they require about 200 acres of older, open- pine forest habitat. The Red-cockaded is not easy to find due to this extensive home range. If one is lucky, he can observe them coming to or from the roost at dawn and sunset. When they have nestlings to feed, they forage in a smaller territory—as few as 30-40 acres (12-20 ha)—in order to feed their young more quickly and effectively. This reclusive bird is rarely observed; however, there are periods when it is more apt to be seen, such as during breeding season and when it is defending its territory. Its range stretches patchily from southeastern Oklahoma and eastern Texas east to Atlantic coast: extends north to Kentucky and south Virginia, south to central Louisiana and southern Mississippi. Populations from central and southern Florida were separated on the basis of their smaller size, but since the size size decreases clinally from north to south, this race is by most considered invalid. This group is now by most included with the nominate form above. The Red-cockaded Woodpecker is a small to medium-sized woodpecker, slightly larger than a bluebird. The Red-cockaded Woodpecker measures 18–23 cm (7.1–9.1 in) in length, has a wing span of 34–41 cm (13–16 in), and weighs 40–56 g (1.4–2.0 oz). The plumage is black and white, except for the red cockade, or ornamental streak of red, above the cheek. The cockade is difficult to see unless the observer is up close. The back is black and filled with white, horizontal stripes which distinguish it from other woodpeckers within its range. The cap and nape are black, and broad white feathers cover the auricular and cheek areas. There is a black moustachial stripe which extends down the sides of the neck and a white spot behind the eyes. Its ventral plumage is white or somewhat gray, and the sides of the breast area display visible black spots. The tail is black, and the outer rectrices are barred with white. 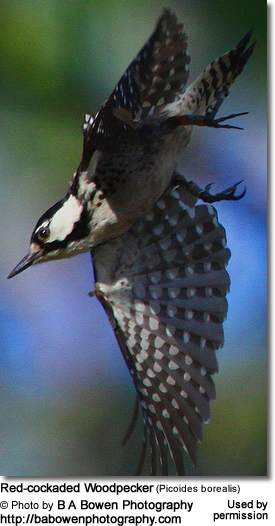 White stripes adorn the black wing coverts and flight feathers. The bill is rather long. The female is slightly larger and lack red crown spots. The juvenile resembles the adult, but his plumage is not as striking. The male’s crown is flecked with white, and he often exhibits a smaller red patch in the center of the crown. The plumage leans toward the brown instead of the solid black of the adult. This is an omnivorous species, feeding primarily on adult insects as well as their larvae and eggs. They will forage for tree-surface and sub-surface arthropods, especially beetle larvae and ants. They also consume beetles, cockroaches, caterpillars, wood-boring insects, spiders, and occasionally fruit and berries. Of the seeds and nuts they eat, pecans are a favorite. A special treat is earworms, particularly the larvae, which they find in cornfields and glean from within the corn kernel. Its foraging habits include tearing away loose bark from the surface with its bill or feet to expose insects. The Red-cockaded Woodpecker enjoys an advanced social system, and it engages in cooperative breeding within a colony, called a “clan.” The mated pair is monogamous and will stay with the same mate for years or possibly forever. Between April and June, the pair builds their nest in the male’s roosting hole, and they begin their family. These nest cavities are drilled out in mature pines at an altitude anywhere from 12-100 feet high in the tree. The holes are 8-12 inches deep, and the 2-inch-diameter opening angles upward to prevent pitch and water from entering the nest. The hen lays 3 or 4 eggs (clutches can range from 2-5 eggs), and members of the communal group assist her in incubating the eggs. Incubation of the tiny, white eggs takes 10–12 days, and for another 26-29 days after they hatch, the chicks remain in the nest cavity and are fed by the group for up to 5 months. After the birds fledge, they will continue to live with the parents as part of the group; the group generally consists of three to four birds, but it can have as many as nine or more members. In each group, only one breeding pair exists; this pair will usually raise just one brood per breeding season. 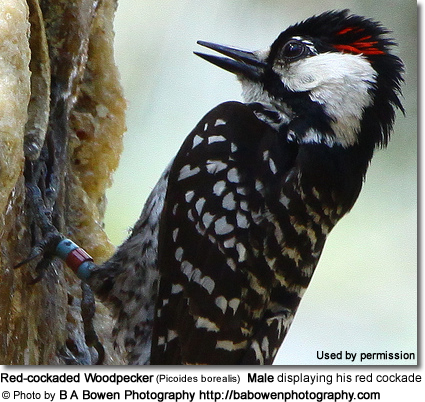 The male parent, like so many woodpecker species, incubates at night. The other members of the group, usually all males, are called “helpers.” These birds have remained in the area from the last breeding season and assist with the incubation and nurturing of the young. The males are available for breeding at the age of one year, but they may or may not set up their own nests, depending on whether they remain with the parents to aid in the care of the next brood. The young females leave the group before the next breeding season begins in order to find a mate. She will travel within the cluster of cavity trees until she locates an unmated male in an area that has no other females. Many of the other species of woodpeckers are famous for destructive excavation in houses, fences, and utility poles, but the Red-cockaded does not exhibit this type of behavior. This is due to its restricted habitat. Unfortunately, once a pine tree has been nested in for a few years, it usually dies due to all the damage inflicted on it by the woodpecker clan which has inhabited it. All the excavation of multiple holes and drilling for sap eventually destroy the tree. The Red-cockaded Woodpecker was originally named Picus querulous due to its loud, harsh calls which gave bird watchers the impression he was quarrelsome and irritable. But today, aviculturists recognize him as quite gregarious, a highly social bird which enjoys being surrounded by others of his species. He uses these sharp vocalizations when communicating with the others. Most heard are the calls which announce his presence and set off an alarm. He uses a churt sound when he is most comfortable—in his home territory and away from predators. The sklit note is given when the bird is in a state of annoyance or disturbance. Other vocalizations include wicka, rattle and chortle calls. These are sounded when he is excited, declaring his position, and exchanging greetings, respectively. Early morning and sunset, as he leaves and returns to his nest, are the times of day when he is most vocal. Once very common, the Red-cockaded Woodpecker is now on the endangered list; one study estimates its numbers to have declined to only 10,000 birds, and the populations are highly fragmented. Efforts to save the species began well before the passage of the Endangered Species Act in 1970. Today, the birds' preferred habitat -- the Long-leaf pine ecosystem -- has been eliminated from 97 percent of the lands it once occupied. But recently, conservationists have been working to preserve and create more and better nesting sites. To this end, clusters of preferred trees have been spared deforestation in order to maintain a number of old-growth, large-diameter trees. In order to attract the birds, controlled burning has been used to lessen the growth of deciduous trees and foliage in these nesting colonies. (The Red-cockaded has shown a preference for forested areas having less deciduous growth in them.) But there is a drawback: Due to the highly flammable resin barriers created by the woodpeckers to protect their nests, those who are doing the controlled burning must be very careful that the burn does not get out of hand. In an effort to increase the Red-cockaded Woodpecker population, the departments of wildlife management in states such as Texas, Louisiana, and Georgia are constructing artificial nesting cavities in Long-leaf pine trees. There are two methods which wildlife management officers use to insert cavities in Long leaf-pines. The more modern and effective approach is to carve out a nesting cavity in the tree and insert a man-made nest into it. 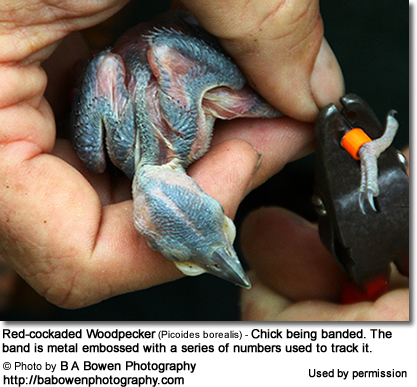 This species readily adapts to these special, artificial nest boxes when they are placed inside pine trees. In intensively managed areas, biologists often paint the base of nest trees with a ring of white paint to make the trees easier to locate. The older and less-used approach is to drill a cavity into the tree, optimistic that the birds will utilize it. One method of preserving existing cavities for this species is to place a “restrictor plate” around the opening, thereby preventing other birds or animals from enlarging the cavity’s entrance and gaining access to it. Due to the efforts of the U.S. 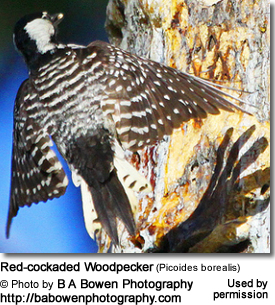 Fish and Wildlife Service’s Woodpecker Recovery program, which includes conservation of the species and the ecosystem in their inhabits, this bird is now found in eleven states: AL, AR, FL, GA, LA, NC, MS, OK, SC, VA, and TX, and it inhabits expanses of federal, state, and private land. The populations have also increased due to these programs from an estimated 4,694 active clusters in 1993 to 6,105 in 2006. The Service also works to conserve the Long-leaf pine ecosystem, which is now considered endangered. 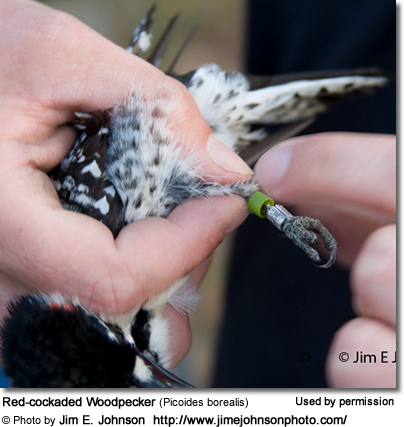 This is all done under the auspices of the FWC's Red-cockaded Woodpecker Safe Harbor Program. Recently, these new approaches—cavity restoration, artificial cavity construction, and the introduction of females into isolated groups—have made some positive advancements towards the increase in populations. The total population is now estimated at about 7,500 individuals. 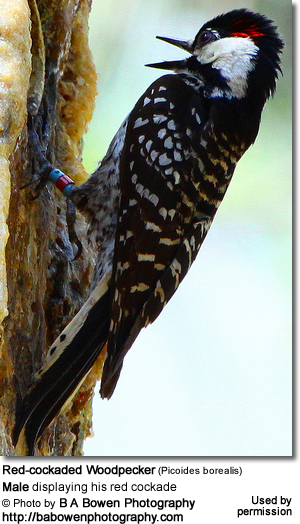 Florida holds the greatest number of both the pines and the Red-cockaded Woodpeckers, and pairs are being released at DuPuis Management Area.